Allie DeBaeke, 13, studies with her tutor, Mr. Hamilton on Thursday, October 25, 2012. Mr. Hamilton volunteers his time once a week to help Allie study for state exams and keep up with her school work. After losing an infant daughter in 2008, the last thing Scott DeBaeke wanted was to lose another. But that’s exactly what he thought might happen this summer when his daughter, Allie, 13, was diagnosed with Hodgkin’s Lymphoma. Allie was born eight weeks premature and has had immune system problems her whole life. Following her diagnosis, she was moved to her grandmother’s house in Jackson County, Mich., where it was cleaner and safer. It would also allow her grandmother, Janice DeBaeke, to take care of her around the clock. Allie has struggled with trying to be a normal seventh grader. She doesn’t get to see any of her friends, and only leaves the house about once a week. A couple teachers from local schools come to help her keep up with school work. Because of her chemotherapy and medications, she has a very restricted diet. Janice makes sure Allie is eating the right foods, taking her medications, and keeping up with her homework. Allie’s mother is the breadwinner for their family and has very little contact with Allie. Her dad stops by a couple times a week to visit with her, but most of his time is spent cleaning their house so Allie can move home. After months of chemotherapy, doctors say Allie’s outlook is good. She hopes to return to school in the spring of 2013. Jared Jarvis, 17, plays Jingle Bell Rock with Allie on trombones on Thursday, December 6, 2012. 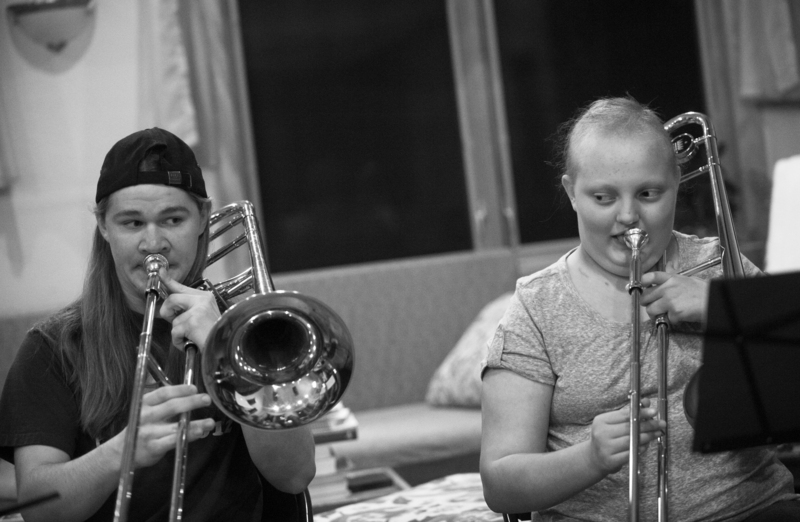 Jarvis is in the marching band and jazz band at Columbia Central and comes over every once in a while to help Allie keep up with trombone lessons. 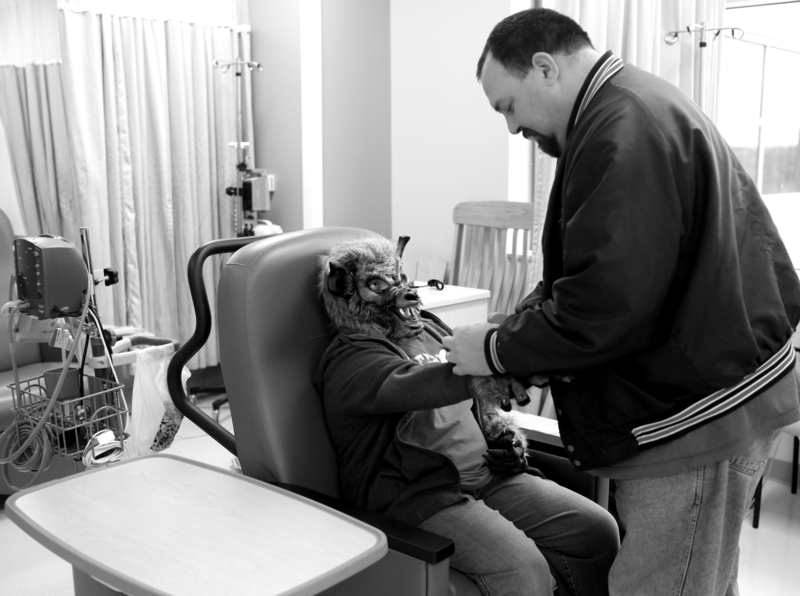 Scott DeBaeke helps his daughter with her werewolf gloves while they wait for a nurse to administer her infusion at Motts Children’s Hospital at the University of Michigan Hospital in Ann Arbor, Mich. on Monday, October 29, 2012. 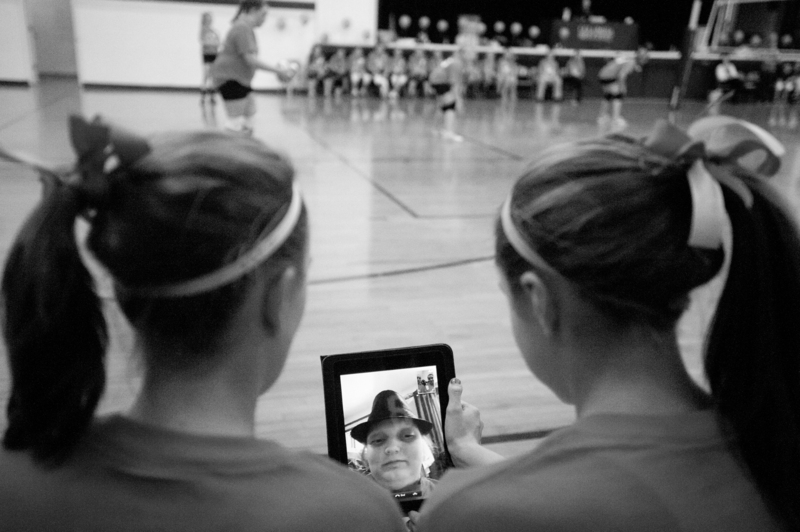 Allie video chats with friends and watches the volleyball game during the Volley for Hope event at Columbia Middle School to raise money for the DeBaeke family. The Volley for Hope and other fundraisers have raised about $2,000 for Allie and her family. 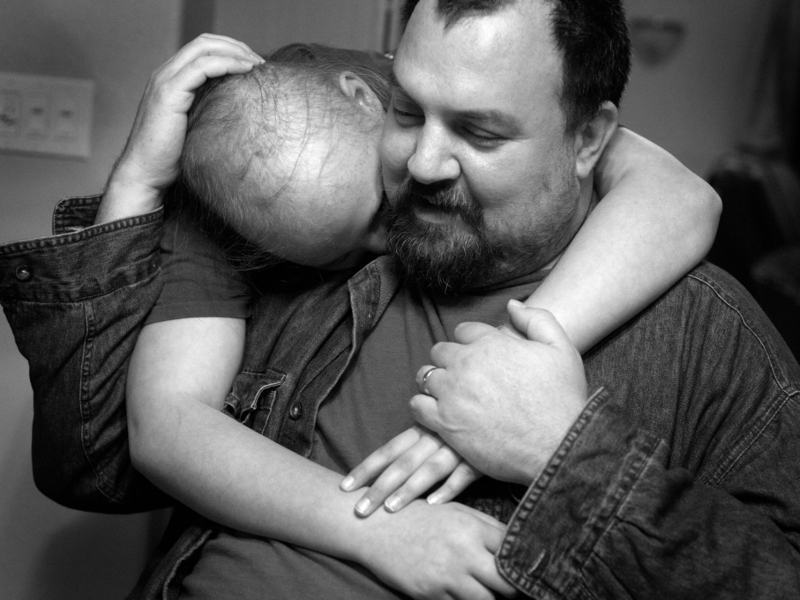 Allie DeBake, 13, and her dad, Scott DeBake, embrace in Scott’s mother’s home in Jackson County, Mich. on Tuesday, November 13, 2012. 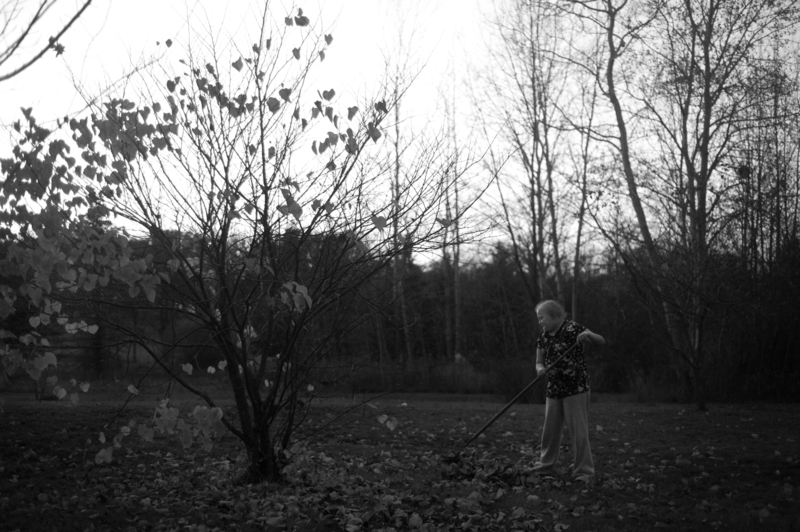 Allie rakes leaves outside her grandmother’s house on Thursday, October 25, 2012. Allie gets her wig adjusted by her aunt, Katie, at the Oakman Beauty Supply in the Jackson Crossing Mall in Jackson, Mich. on Saturday, October 10, 2012. Allie’s aunt loves to spoil her niece; she bought her two wigs, a monkey hat, and lots of wig accessories that day. 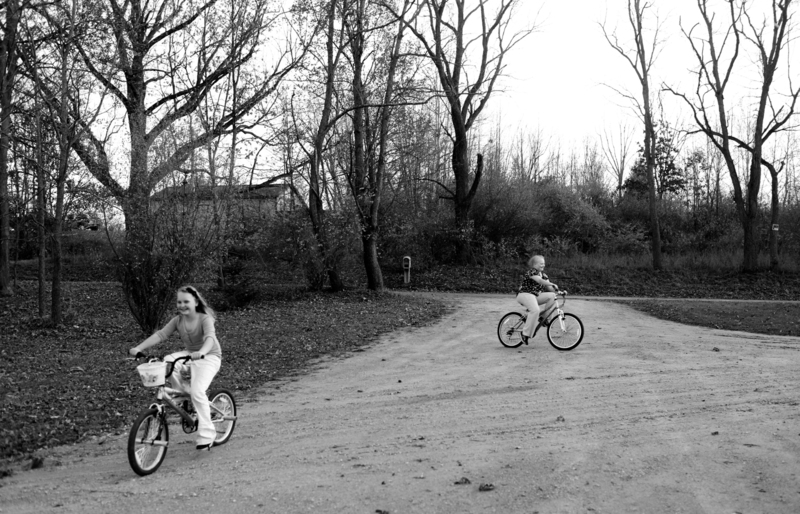 Allie and her cousin Morgan ride their bikes in front of their grandmother’s home in Jackson County, Mich. on Thursday, October 25, 2012. Allie doesn’t get to see her friends very much, but gets to play with her cousins when they visit.